Commonly known as bugbane in reference to the odoriferous insect repellant properties of this plant, 'Black Negligee' is best noted for its deeply-cut, dark purplish-black leaves. The creamy white, strongly fragrant flowers appear in late summer to early fall in long fluffy spires. 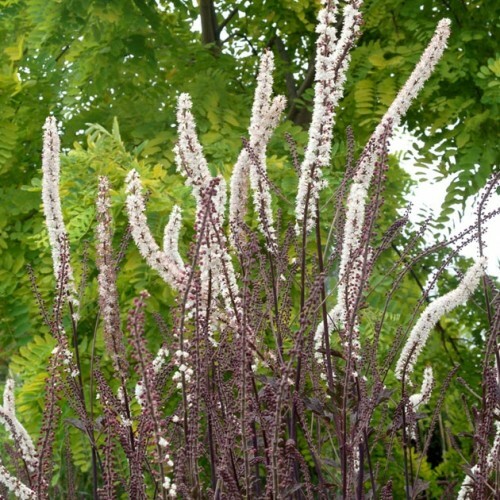 Actaea simplex is easily grown in average, medium moisture soils in partial to full shade. It prefers a woodland-like environment with humusy, organically rich, moisture-retentive soil. Foliage tends to scorch and otherwise depreciate if soils are allowed to dry out. Best sited in locations that are sheltered from strong winds. This is a slow-to-establish plant but well worth the wait!